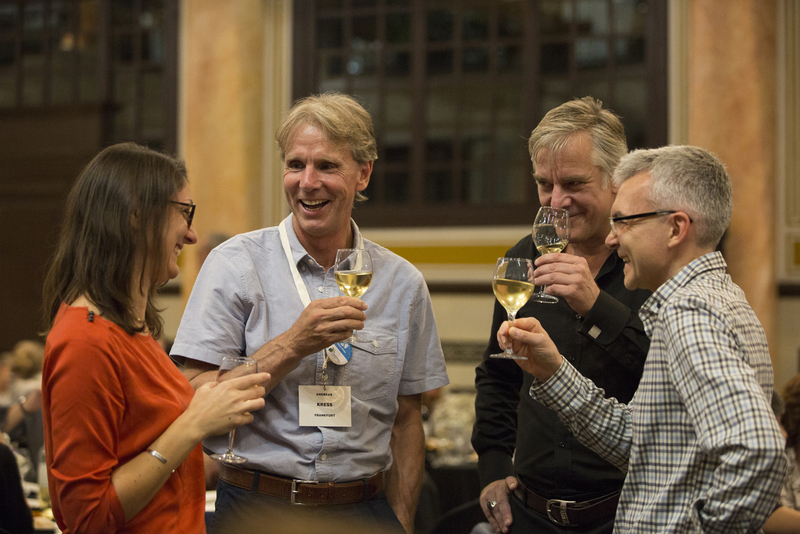 From 1 to 3 October 2018, over 250 participants were gathered in Barcelona, Spain for the Climate Alliance International Conference 2018 (#CAIC18) . The event was part of the United Nations Talanoa Dialogue process on Climate Change. Ahead of the 24th Conference of the Parties (so-called COP24) in Katowice, Poland, in December 2018, representatives of local authorities adopted the Barcelona Declaration. They are aiming to call upon the EU and national governments to build upon the work of cities and regions in order to achieve national and international climate goals. Supporting their partner and organisation, Climate Alliance and two SCORE partners were present at the Climate Alliance Conference to promote Consumer Stock Ownership Plans (CSOPs) as a local financing solution to representatives of local authorities from all over the world. It was also an opportunity to gain input from discussion circles and to connect with other H2020 projects with a similar focus, like the EuroPACE Project, which is dealing with financing models for energy efficiency measures. 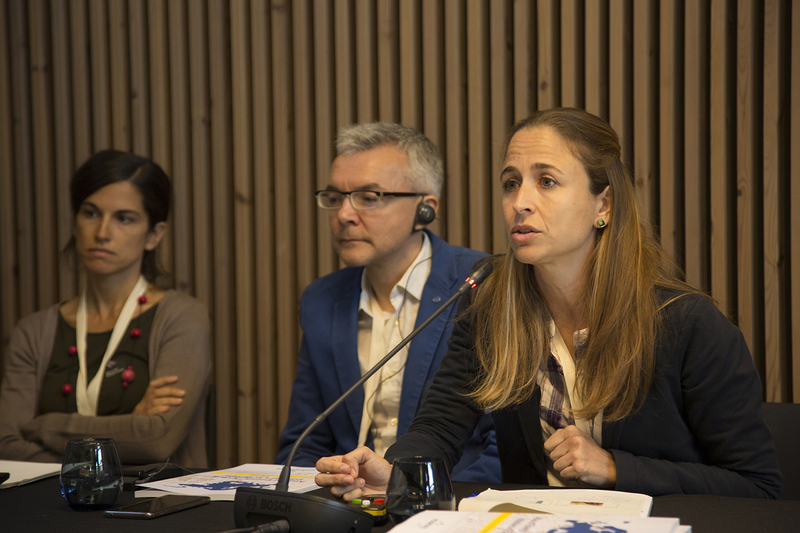 On 1 October, Prof Lowitzsch from the European University Viadrina presented the CSOP approach to financing RE at the Climate Alliance Working Group on Financing. In particular, he emphasized that CSOPs facilitate the involvement of municipalities as a pacemaker of the energy transition. Thus, the advantages of the SCORE approach for overcoming obstacles to municipal co-investments with their citizens were in the focus of the presentation. Furthermore, turning consumers into prosumers is crucial for incentivising energy efficient behaviour. This is what many municipalities across the globe are still struggling with. Other than bringing together the interests of local citizens and their municipalities, this is an important prerequisite for preferential conditions under the “enabling framework” for prosumership of the 2018 recast of the Renewable Energy Directive (RED II). Art 21 RED II defines a Renewable Energy Community amongst others as a legal entity whose “shareholders or members are natural persons, local authorities, including municipalities, or SMEs”. Dariusz Szwed presents the SCORE pilot in Słupsk. 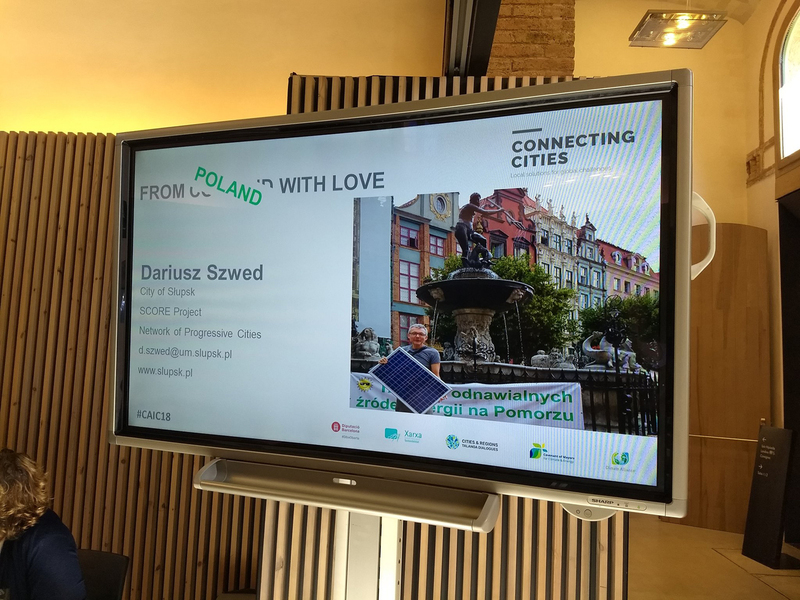 Darius Szwed from the Polish city of Słupsk – one of three SCORE pilot regions – illustrated the potential of CSOPs for inclusiveness during the panel of the connecting circle “The social component of the energy Transition." He presented the first of a series of pilots planned in Słupsk: the Holy Brother Albert homeless shelter. The project enables up to 70 residents of the shelter to acquire 25% of a PV installation donated by IKEA Poland and now owned by the municipality. In this “Simplified CSOP” of the Holy Albert case the participation of the homeless is facilitated by a matching contribution. It should be noted, however, that the typical CSOP does not involve donations and is solely financed by its participants. For further information on the Polish pilot project, please contact Mr Szwed. One of the unique selling points of a CSOP is its inclusiveness. In particular, citizens with a low income – who as a rule do not dispose of savings necessary for conventional investment schemes – are enabled to repay their share of the acquisition loan from the future earnings of the investment. Through the leveraged financing approach, CSOPs in general allow for the participation of societal groups threatened by energy poverty, typically low-income households as for example single parents, unemployed, pensioners, etc. ; hence, CSOPs are low-threshold and more inclusive than established financing models. In the case of a “simplified CSOP” a) the RE installation is donated while b) the acquisition of the equity share by the consumer-beneficiaries is additionally facilitated by a matching contribution from a donor. As a result the joining consumers need an even smaller initial contribution to participate and do not have to wait for the amortisation of the investment before they benefit from revenues. Both elements are of importance with regard to particularly vulnerable groups like the homeless living in the shelter run by the charitable association Holy Brother Albert in Słupsk. For more information on this event, please visit the Climate Alliance website.